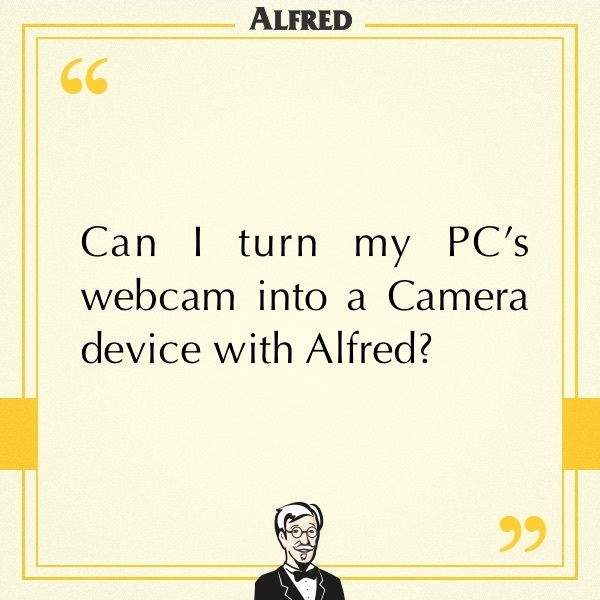 Can I turn my PC's webcam into a Camera device with Alfred? - Frequently Asked - Alfred Center | get the most out of the best home security app! Can I turn my PC's webcam into a Camera device with Alfred? Can I turn my PC’s webcam into a Camera device with Alfred? Not at the moment, but we do plan to make that happen one day! For now, Alfred is a mobile app that can be downloaded onto smartphones and tablets to turn them into security cameras/baby cams/nanny cams/pet monitor, but Alfred can’t work that way on a computer. However, you can already monitor your Camera devices from your PC by opening our WebViewer with Firefox (the Chrome version will be available very soon), but your PC’s webcam is entirely something else! Can I use my computer as the camera? ¿Puedo usar la webcam de una PC como cámara de vigilacia?